A better, calmer morning with temperatures looking set to rise nicely in the afternoon. 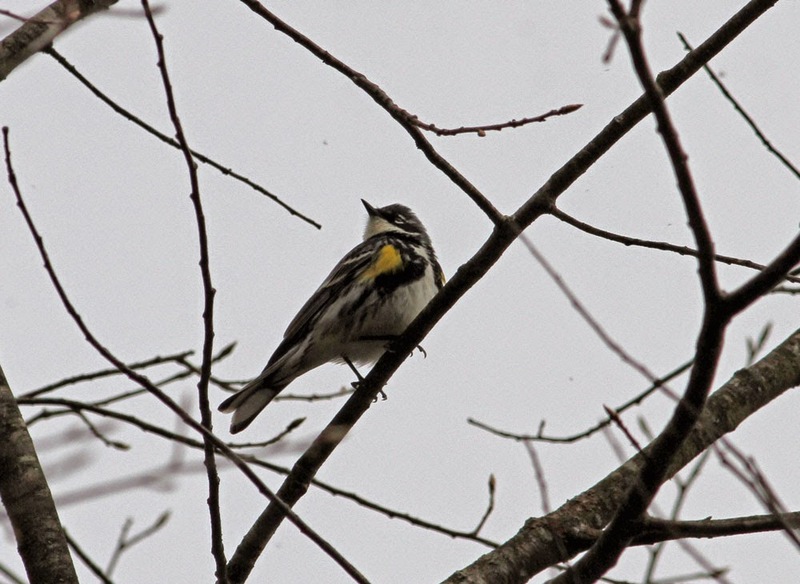 Lots of birdsong around Gill this morning including a couple of year-firsts....a Yellow-throated Vireo singing just south of the intersection with North Cross and Main Roads, and a Black-throated Green Warbler down at Barton Cove where there was yet another new Louisiana Waterthrush to add to the relative abundance of the species in Gill. Louisiana Waterthrush - Barton Cove, Gill, Franklin Co., MA. April 29th, 2015. Waterbirds were few on the cove but a Common Goldeneye lingers along with a Common Loon and at least five Ring-necked Ducks. Common Goldeneye - female, Barton Cove, Gill, Franklin Co., MA. April 29th, 2015. Starting to get late for this species in Franklin County. A bigger surprise, especially given the calm conditions, was the presence of at least 25 American Pipits in a pasture off North Cross Road and a Greater Yellowlegs foraging in a puddle off Main Road just north of the intersection with North Cross. Frustratingly, I didn't have time to bird this morning.....all of these were more or less incidental sightings but it sure looked like a good morning to be out.....wish I could have done more. Greater Yellowlegs - Main Road, Gill, Franklin Co., MA. April 29th, 2015. What I assume was the same bird was on the same pool on April 26th. Stopped by Barton Cove for ten minutes this morning on my way to an appointment. 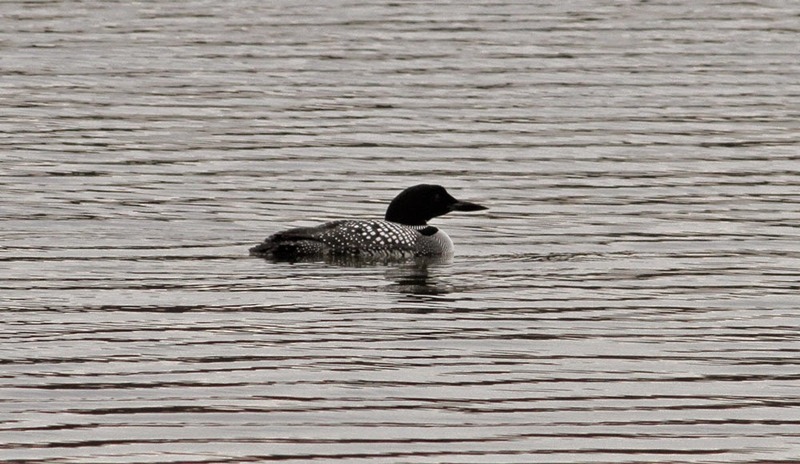 Nice to see Common Goldeneyes (2) and Ring-necked Ducks (10) lingering plus a continuing non-breeding Common Loon. 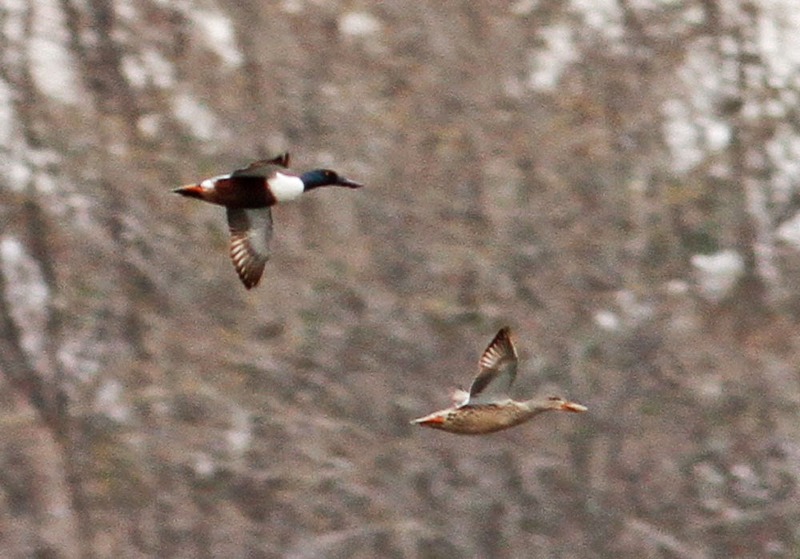 Two Northern Shovelers and a male Green-winged Teal were more recent arrivals. 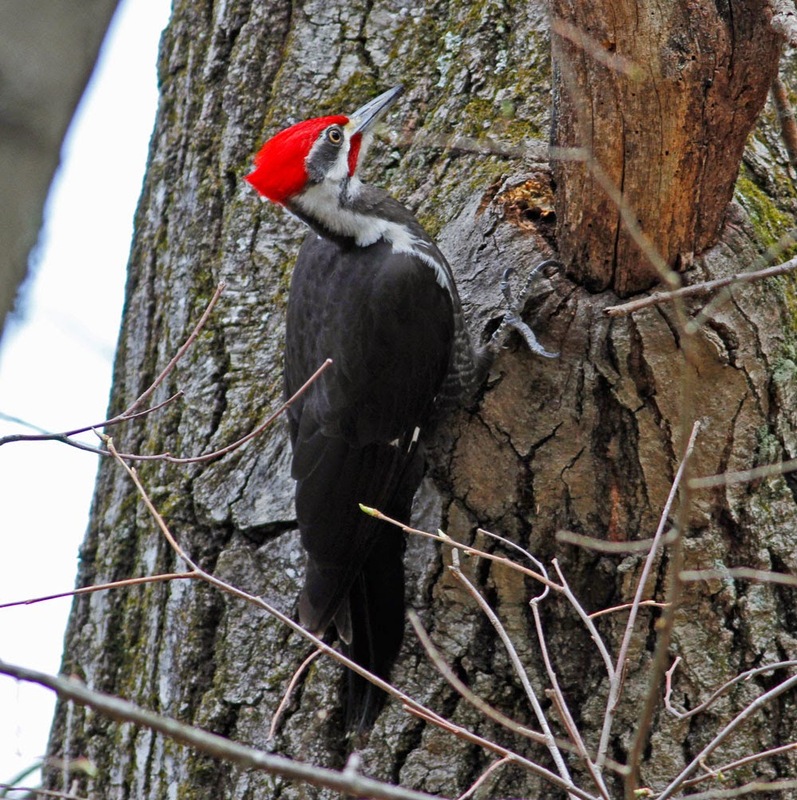 There was also a lot of Pileated Woodpecker activity in the woods along the campground road and a singing vireo there which I'm pretty sure was a Blue-headed. Northern Shoveler - male and female, Barton Cove, Gill, Franklin Co., MA. April 27th, 2015. Common Goldeneye - two females with female Common Merganser, Barton Cove, Gill, Franklin Co., MA. Other than that, the woods continue to be rather quiet as the constant northerlies do their worst.......I'd normally expect to be hearing Ovenbird, Black-throated Green Warbler and American Redstart in the woods by this time, though I did manage a FOY House Wren along the power canal yesterday. We could see some south-westerlies by Wednesday/Thursday which will hopefully bring warmer days and widespread arrivals of familiar summer migrants. 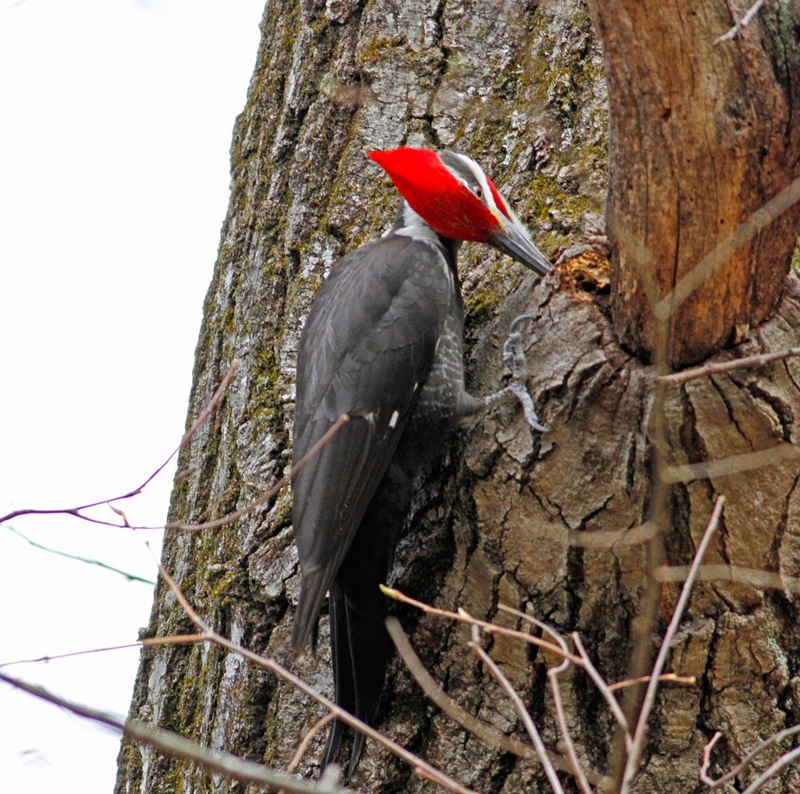 Pileated Woodpecker - male, Barton Cove, Gill, Franklin Co., MA. April 27th, 2015. 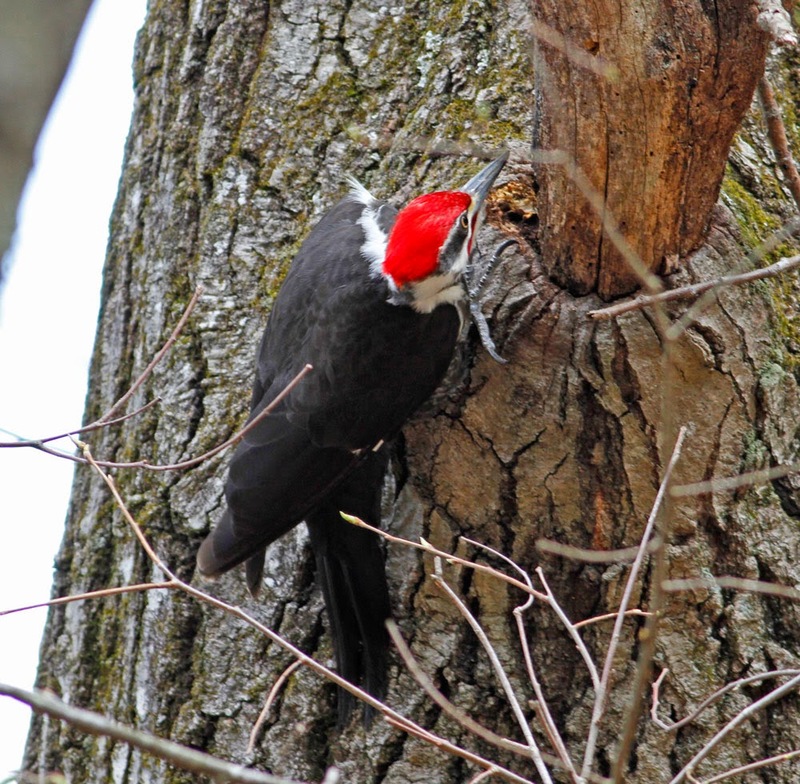 Local Pileateds tend to be quite skittish but this bold male was rather approachable today. So we're back into cold northerlies and even had to endure snow flurries this afternoon! 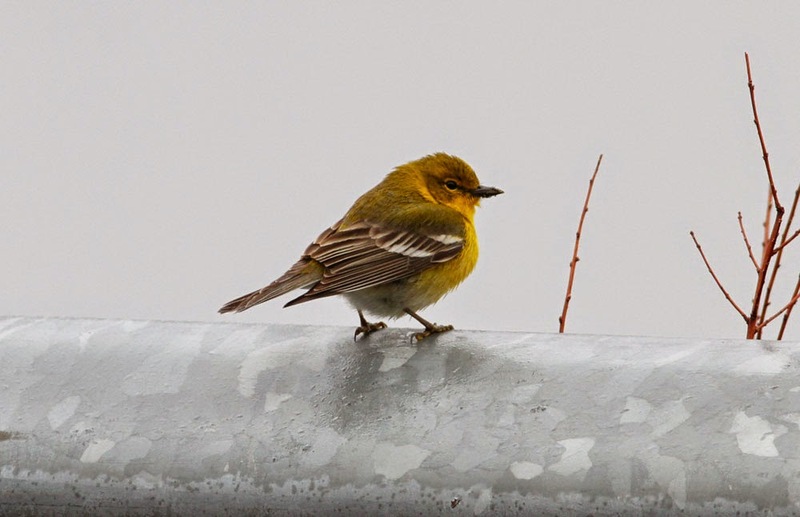 Migrants continue to trickle in with widespread arrivals of Ruby-crowned Kinglets, Blue-gray Gnatcatchers and Yellow-rumped Warblers. In Gill, I had my first Northern Waterthrush of the season on North Cross Road on the 22nd and Louisiana Waterthrushes continue to impress there with many territories, including one on the stream right behind the Gill Tavern! This afternoon Matan and I headed up to Guildford in southern Vermont to look for salamanders only to encounter a blizzard when we got there! It was short lived though, and although I had few expectations bird-wise, Weatherhead Hollow Pond produced a few nice surprises namely a flock of about 25 Yellow-rumped Warblers and an eastern Palm Warbler along the shore, and my first local Green Heron of the year. Green Heron - Weatherhead Hollow Pond, Windham Co., VT. April 23rd, 2015. 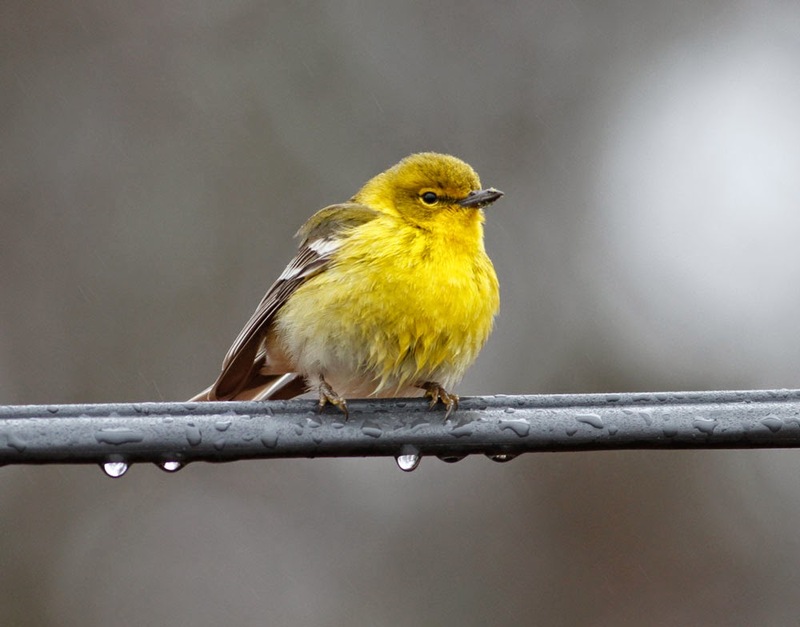 Yellow-rumped Warbler - male, Weatherhead Hollow Pond, Windham Co., VT. April 23rd, 2015. One of a fairly large flock of about 25 males sitting out a snow storm! Barton Cove in Gill was again rather quiet this morning but produced a 'new' non-breeding plumage Common Loon and a Greater Yellowlegs. 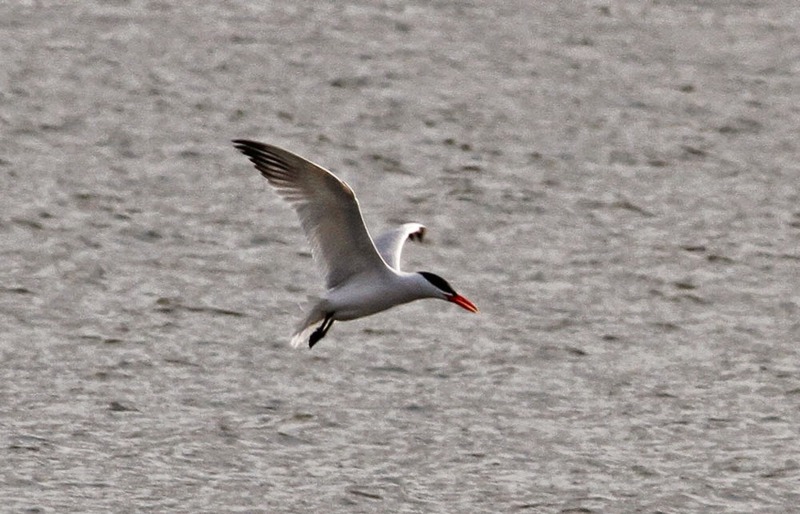 Caspian Tern - Barton Cove, Gill, Franklin Co., MA. April 21st, 2015. 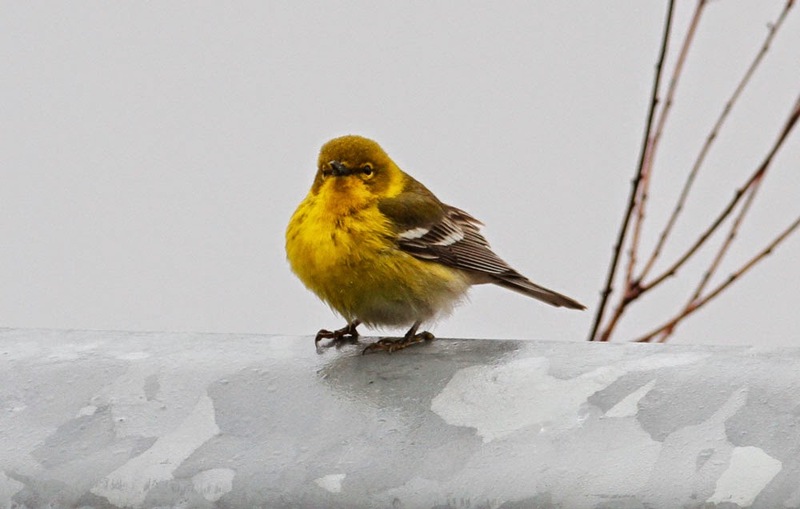 A scarce but perhaps expected migrant through the CT River Valley in late April/early May. The last few days have been a bit lack-luster in the Gill/Northfield area. Even the passage of a front yesterday brought lots of moisture but little else. Today was a little different and I made four rather brief stops at Barton Cove during the day and came up with new birds on each visit. 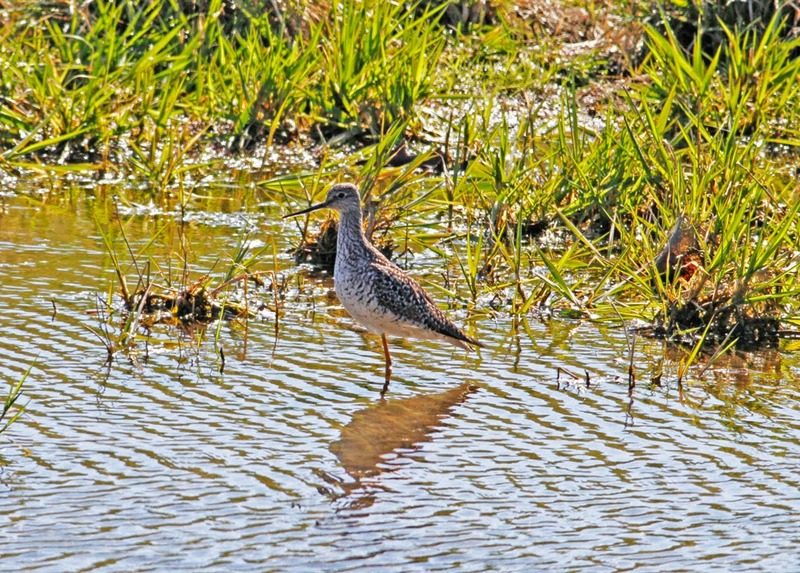 My first visit saw very low water levels at the cove with an exposed sand bar producing two Greater Yellowlegs. Close to them was a nice male Bufflehead. Just before noon in showery conditions, a nice a arrival of about a dozen breeding plumage Ring-billed Gulls and five American Herring Gulls. 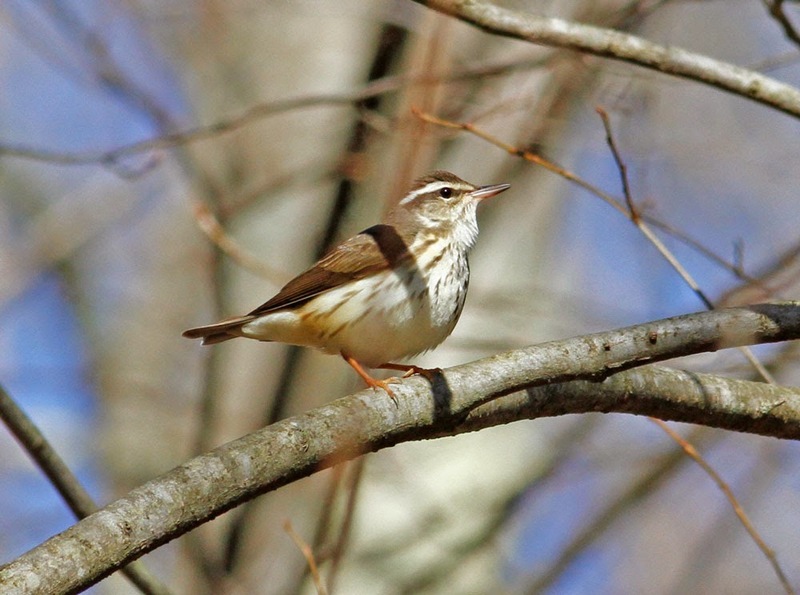 Riverview Drive also had a singing Blue-gray Gnatcatcher and a Black-and-white Warbler, both new for the year. In mid-afternoon, I was more focused on going for a bike ride than birding but stopped to check Barton Cove anyway and was glad I did. 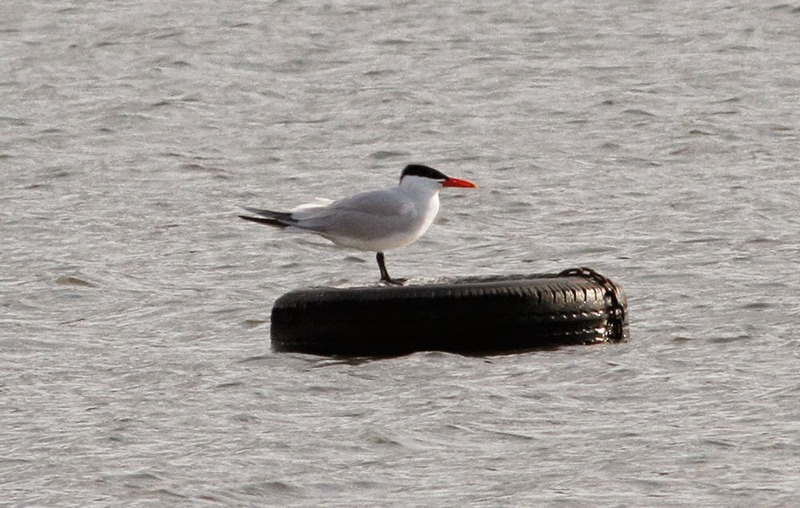 There, sat of one of the tires in the middle of the cove, was a fine adult Caspian Tern and Bill Lafley was already scoping the bird as I pulled up. 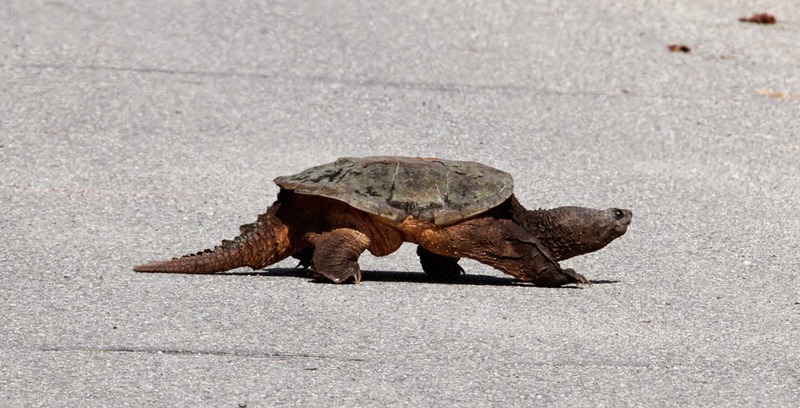 Even more impressive was an absolutely massive Snapping Turtle making its way across Riverview Drive........slowly! Snapping Turtle - huge specimen crossing Riverview Drive, Barton Cove, Gill, Franklin Co., MA. April 21st, 2015. On my way back through Gill in the evening, I stopped for a fourth and final time at Barton Cove. The Caspian Tern was still there, but impressively the Double-crested Cormorants had built up from two this morning to 16 by early evening. 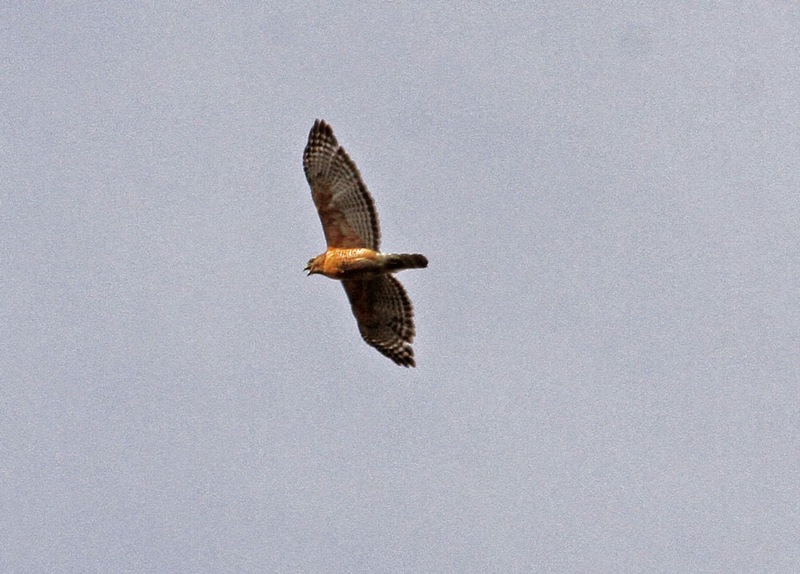 Overhead, actually quite high overhead, Broad-winged Hawks passed over on a broad front and I logged roughly 15 birds over the 20 minutes that I spent at the boat ramp. Greater Yellowlegs - two, Barton Cove, Gill, Franklin Co., MA. April 21st, 2015. Distant shots but identified by diagnostic calls. Common Loon - adult, Barton Cove, Gill, Franklin Co., MA. April 20th, 2015. One of two present. 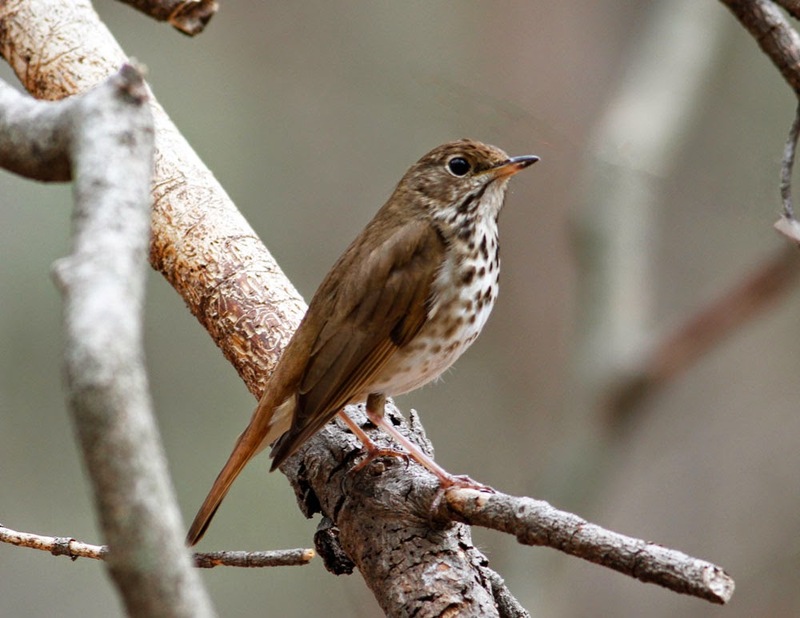 Hermit Thrush - Northfield, Franklin Co., MA. April 19th, 2015. 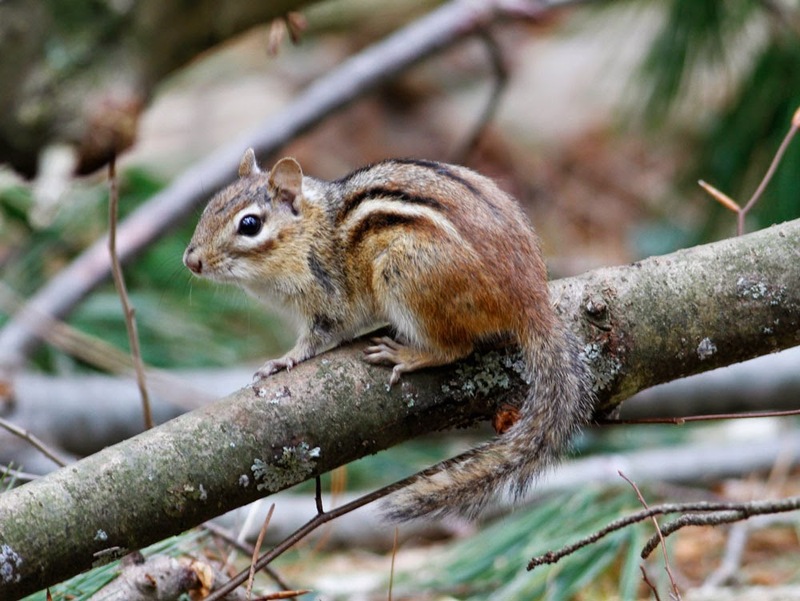 Eastern Chipmunk - Northfield, Franklin Co., MA. April 19th, 2015. Back in Gill/Northfield, a steady but notable increase in species such as Yellow-bellied Sapsucker, Hermit Thrush, Louisiana Waterthrush, Pine Warbler, Field Sparrow and Purple Finch over the last few days and my first Blue-headed Vireos of the year in Bernardston and Northfield over the weekend (on the 19th). If I was to nominate a 'bird-of-the-week' this week, it would have to be Louisiana Waterthrush. 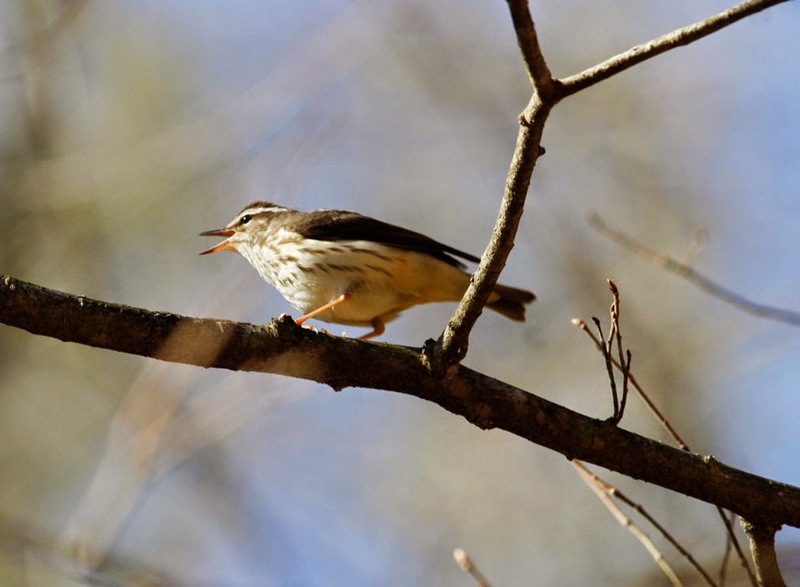 It's beautiful descending song is perhaps one of the most instantly recognizable bird sounds in the woodland around Franklin County and a sure sound of spring. In particular, the towns of Greenfield, Gill and Northfield seem to be especially good for them with most suitable wooded streams in those towns supporting one or more pairs. After hearing my first of the year on North Cross Road, Gill yesterday, they arrived en masse overnight - for example, three singing males along a one mile stretch of River Road in Gill this morning. They prefer fairly substantial fast flowing streams in mixed woodland dominated by Eastern Hemlocks, a habitat shared by Winter Wren. Both species are shy and skulking, and much easier to hear than actually see. However, the canopy is still leafless at the moment and will be for a couple of weeks so the opportunity to is there to get out into the woods and get good views and audio of two of the more exciting species that we have in Western Massachusetts. 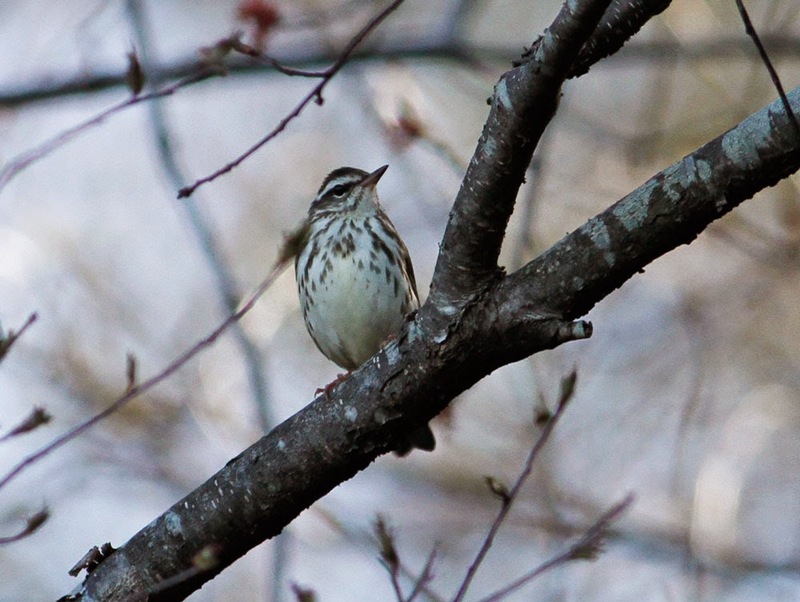 Louisiana Waterthrush - River Road, Gill, Franklin Co., MA. April 15th, 2015. 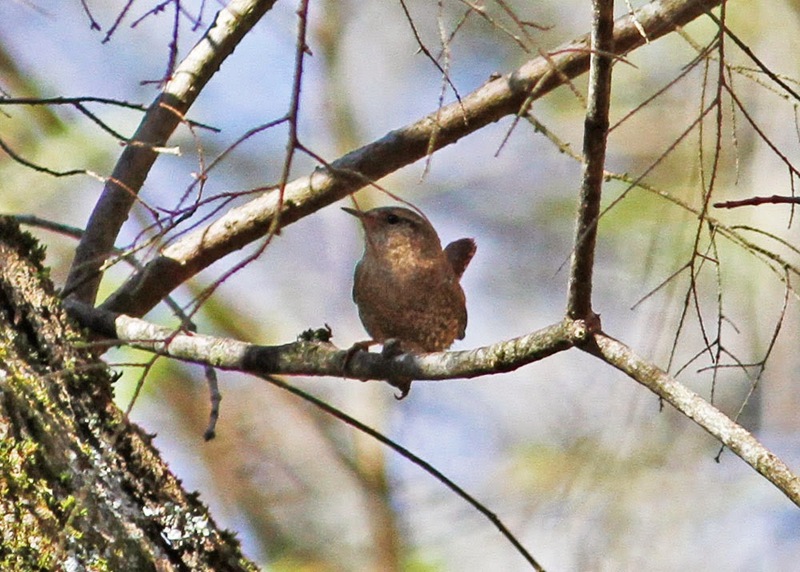 Winter Wren - River Road, Gill, Franklin Co., MA. April 15th, 2015. 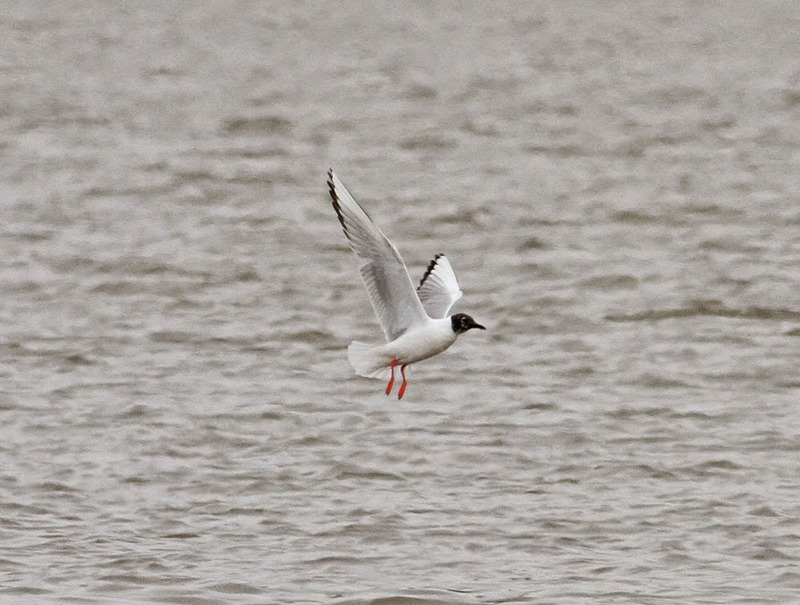 Bonaparte's Gull - adult, Barton Cove, Gill, Franklin Co., MA. April 14th, 2015. Yet another fabulous day of spring migration in the Connecticut River Valley, full of diversity. 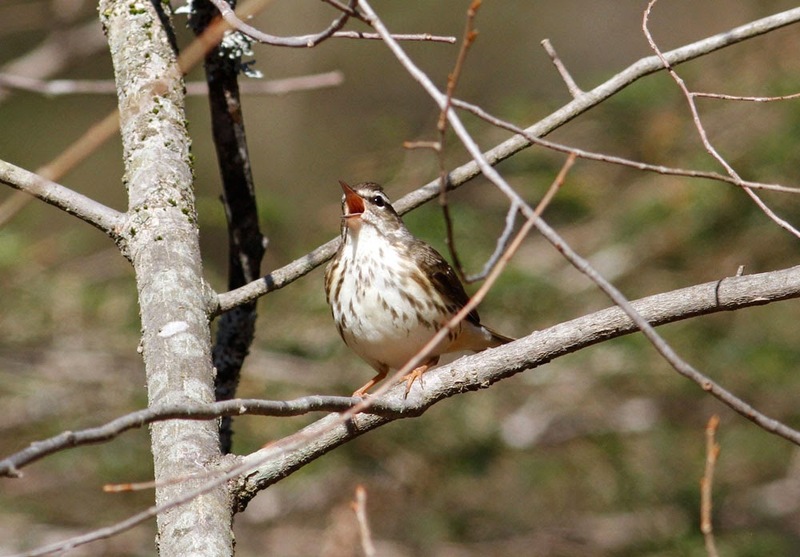 The day got off to the best possible start with a singing Louisiana Waterthrush on North Cross Road in Gill, and actually a whole host of new songsters along that road including Winter Wren, Swamp and Chipping Sparrows as well as loads of Yellow-bellied Sapsuckers. 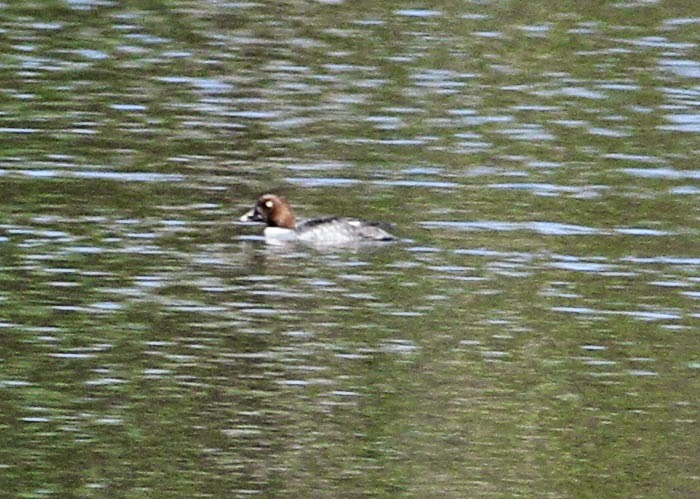 Canvasback - female, Hinsdale Bluffs, Cheshire Co., NH. April 14th, 2015. After dropping Matan at school, I headed north to Hinsdale in New Hampshire and cycled out to the bluffs overlooking the Vernon Dam. I was hoping for a repeat of yesterday's raptor migration in Gill but as the wind swung around to the north-west it seemed to stifle any visual migration. 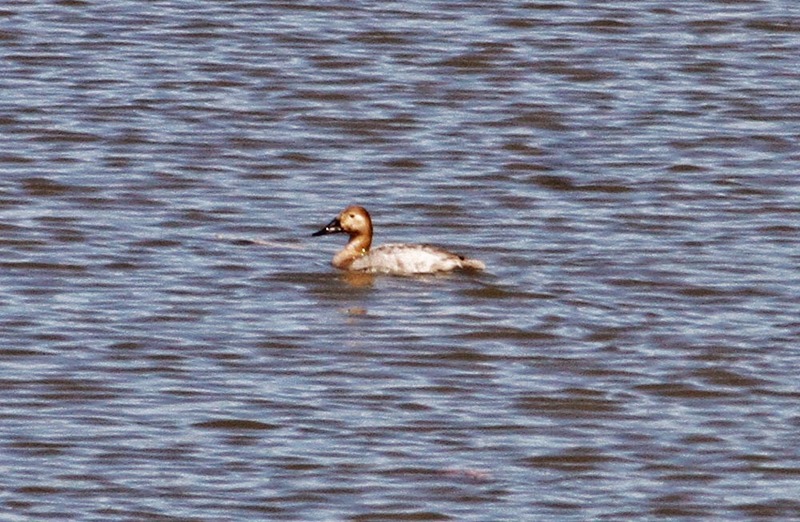 However, the bluffs yielded some great new birds for this spring including five Long-tailed Ducks and 5 Bonaparte's Gulls, as well as a female Canvasback, the latter initially found by Dave Johnson who spotted it from the Vernon side of the river. Hundreds of swallows were in the area including my first Barn Swallows of the year and finally warblers in some numbers with Yellow-rumped, Palm and Pine Warblers all heard and seen around the bluffs. With them came quite good numbers Ruby-crowned Kinglets. Careful scanning also produced Greater and Lesser Scaups together, two Red-necked Grebes and a cracking female Barrow's Goldeneye. 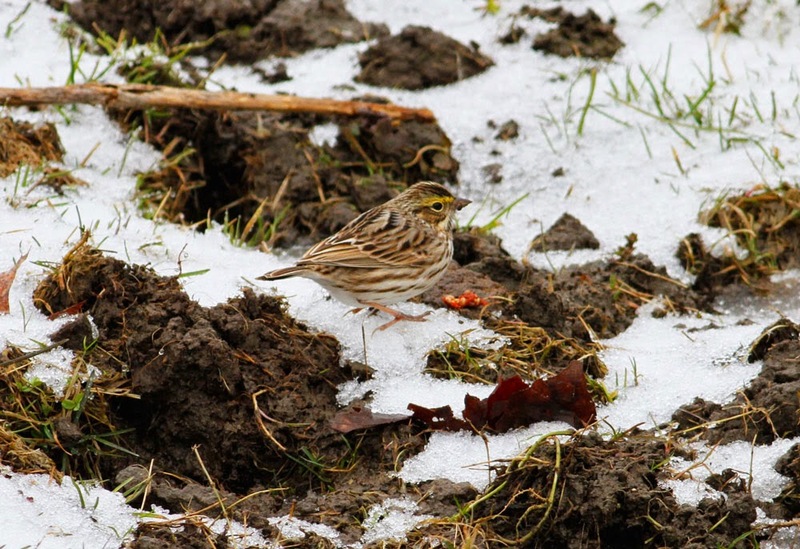 The latter could be my first April observation of a Barrow's anywhere in the valley. As usual, I wrestled with distance at Hinsdale so apologies for the heavily cropped images. Barrow's Goldeneye (right) - female with female Common Goldeneye, Hinsdale Bluffs, Cheshire Co., NH. April 14th, 2015. 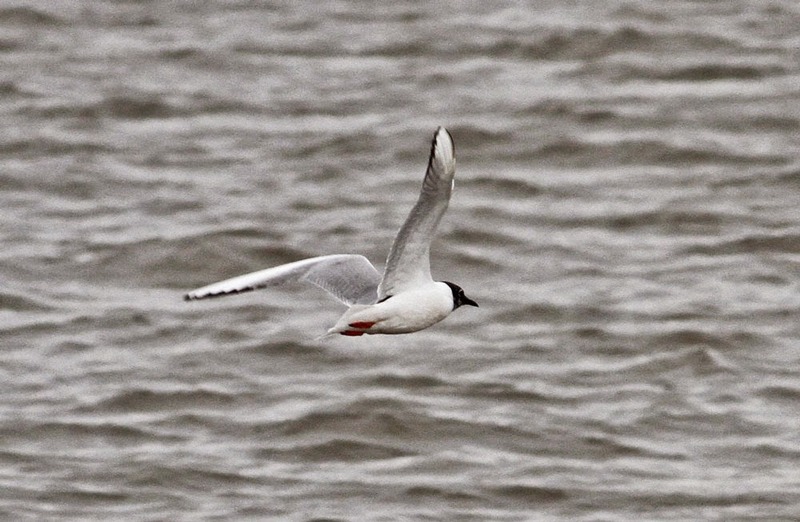 A quick stop at Barton Cove in the evening produced nice views of two Bonaparte's Gulls, possibly the same 'hooded' gulls reported on the Western Mass Birders Facebook page earlier in the day. A Wilson's Snipe on Ben Hale Road in Gill was a nice surprise and a great way to end another very interesting day in our area. 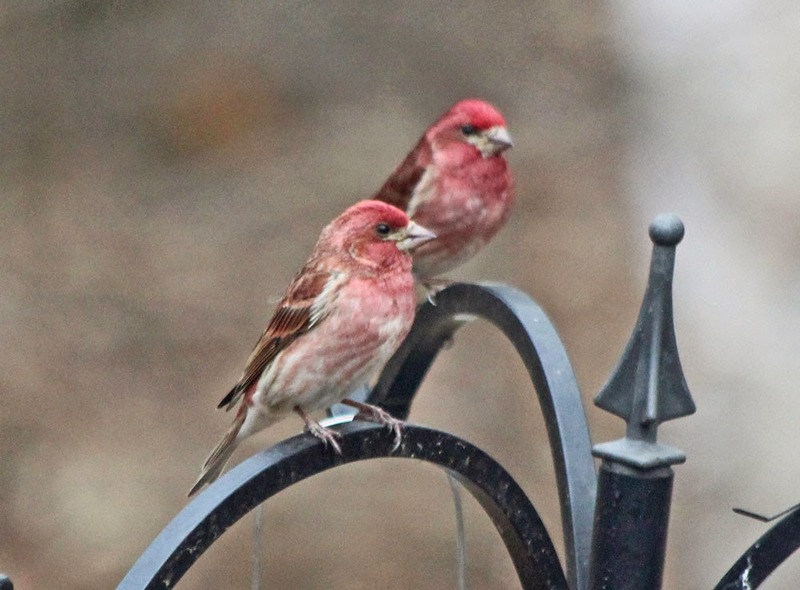 MA - Purple Finch bonanza! I must confess that I'm not a big fan of feeder watching - I'd much rather be out in the field somewhere rather than looking at birds through the kitchen window but periodically I'm just blown away the sudden appearance of certain species at our feeders, especially when there's no indication that anything cool is about to happen. 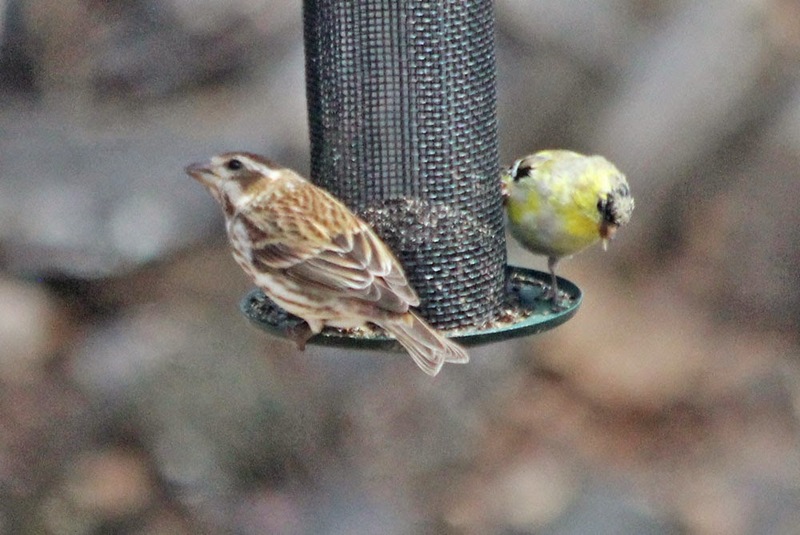 Early this afternoon, our near-empty feeders attracted four Purple Finches which I found especially remarkable because it seems to have been a relatively poor late winter/early spring for them in Gill/Northfield. 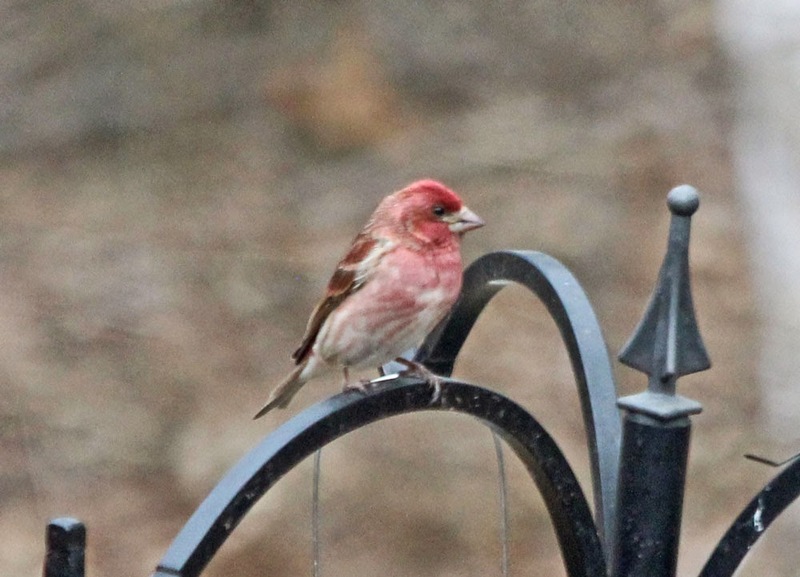 I can only recall hearing one other Purple Finch this spring and that was on North Cross Road, Gill in late March. 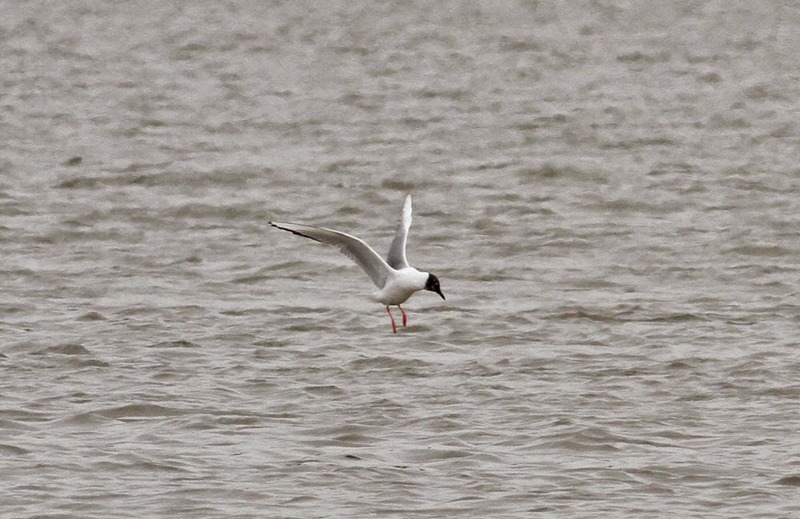 This female-type was the first to arrive with the males below arriving as a group of three about an hour later. These birds didn't stay long either but I did manage to get these pics through a rather grimy kitchen window! Purple Finches - Northfield yard, Franklin Co., MA. April 14th, 2015. Red-shouldered Hawk - displaying, Barney Hale Road, Gill, Franklin Co., MA. April 13th, 2015. 15 Broad-winged Hawk - all adults, FOY. Mostly singles but one 'kettle' of three. 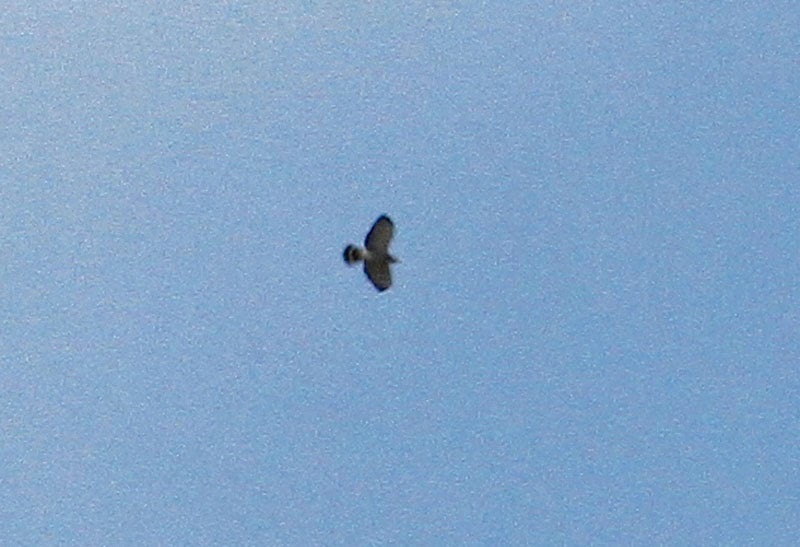 1 Merlin - possibly local. 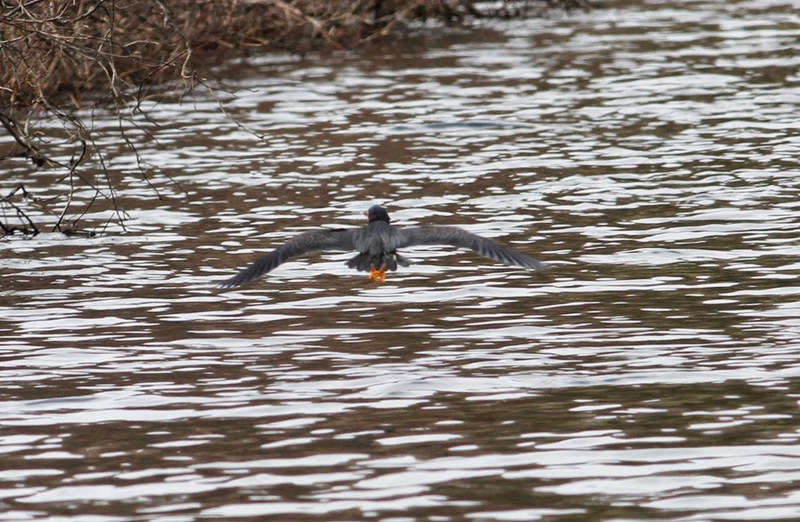 Also involved, 5 Double-crested Cormorants and a 'heard-only' Sandhill Crane. The latter was calling high above the boat ramp but frustration set in as I scanned the clear blue skies without success. I'm not surprised by this. I've had similar experiences with heard-only Common Cranes migrating above the desert in southern Israel with the birds clearly audible but almost impossible to find in a cloudless sky. The Sandhill Crane was heard passing overhead at about 10;40hrs. Broad-winged Hawk - heavy crop of distant adult, Barton Cove, Gill, Franklin Co., MA. April 13th, 2015. A total of 17 for the day, with 15 over Barton Cove in the morning and two singles over Gill later in the day. Common Loon - adult breeding, Hinsdale Bluffs, Cheshire Co., NH. April 12th, 2015. Double-crested Cormorants - five heading north, Barton Cove, Gill, Franklin Co., MA. 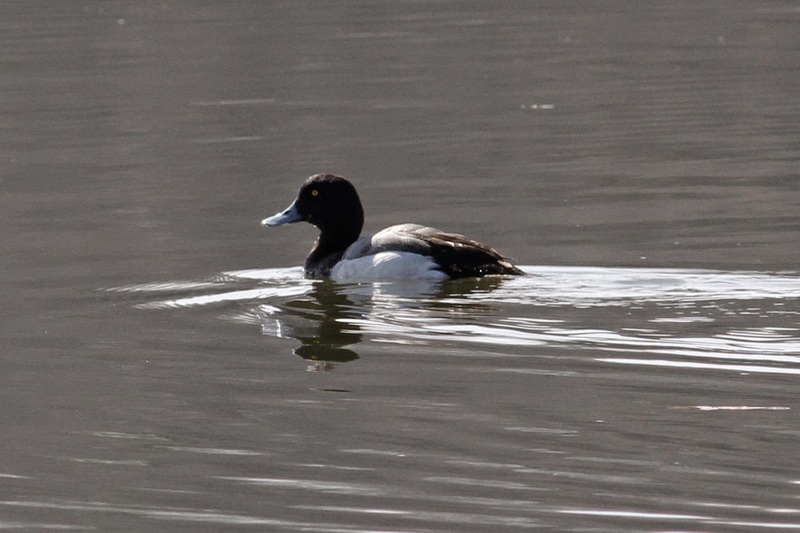 April 13th, 2015.
scaup sp., - Barton Cove, Gill, Franklin Co., MA. April 13th, 2015. 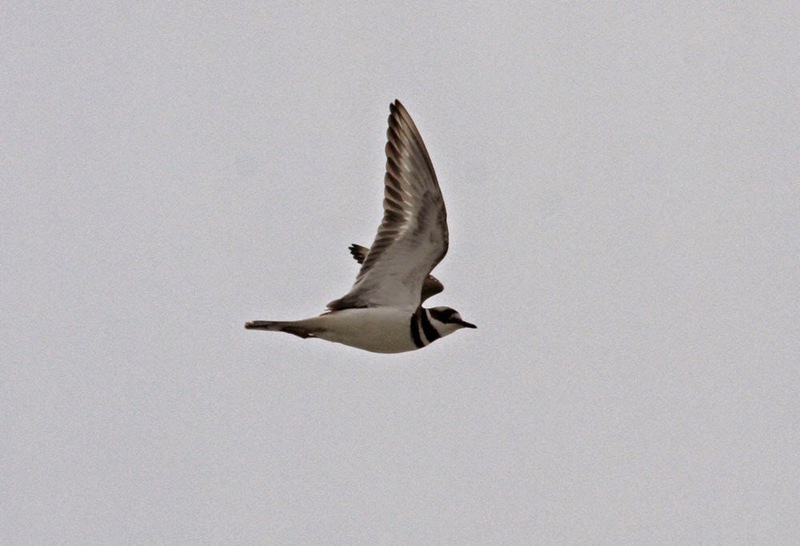 Initially thought to be Greater but wing pattern, seen briefly, more suggestive of Lesser. Red-breasted Mergansers - adult males, Hinsdale Bluffs, Cheshire Co., NH. April 12th, 2015. 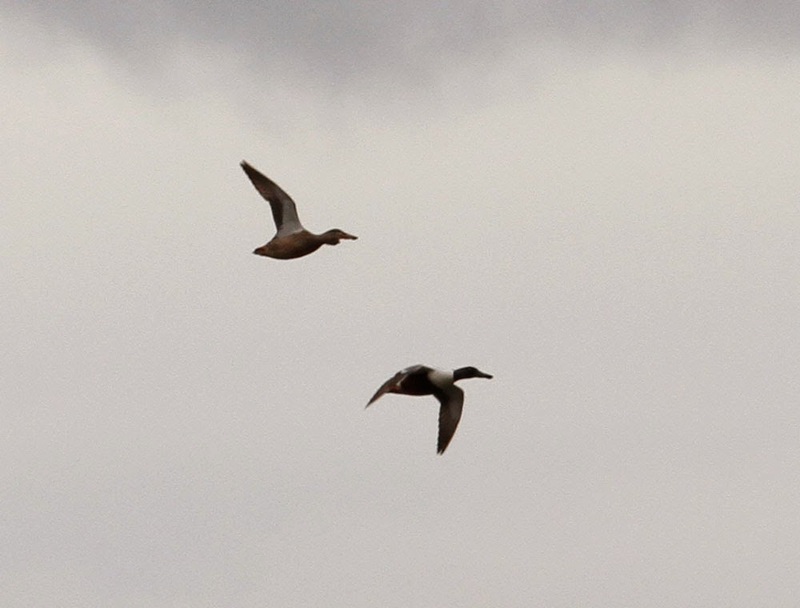 A bumper day for these at Hinsdale with Hector Galbraith recording an additional six birds. 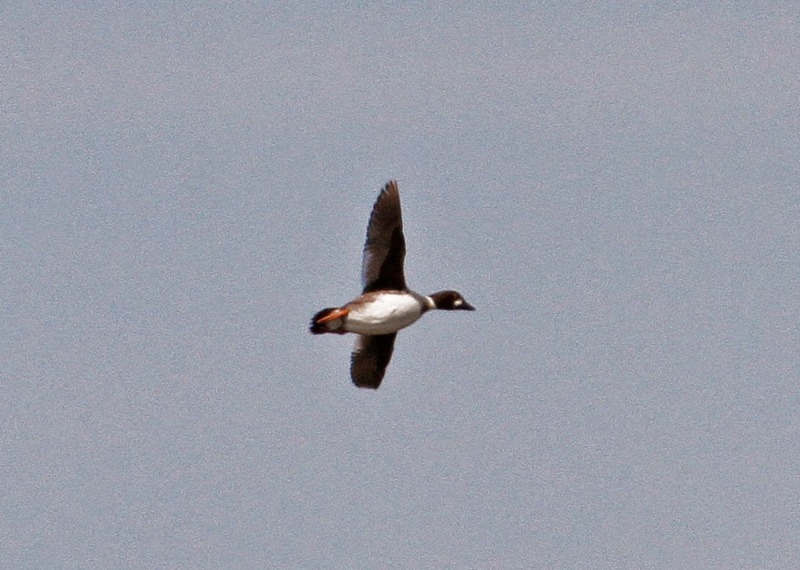 Common Goldeneye - immature male, Hinsdale Bluffs, Cheshire Co., NH. April 12th, 2015. The boat ramp area also produced three singing Pine Warblers, a drumming sapsucker, a singing Common Yellowthroat, a Savannah Sparrow and an intriguing scaup which I initially logged as a Greater Scaup but decided to leave it unidentified. Earlier in the morning, I stopped on Barney Hale Road, Gill to watch a displaying Red-shouldered Hawk and heard my first singing Winter Wren and Hermit Thrush in the process. After a lack-luster tail end to last week the pulse of visual migration this morning was immediate and obvious. And with winds in the southern quarter all day and forecast to go into tomorrow I think we can expect a rush of new year birds, and perhaps one or two rarities!! 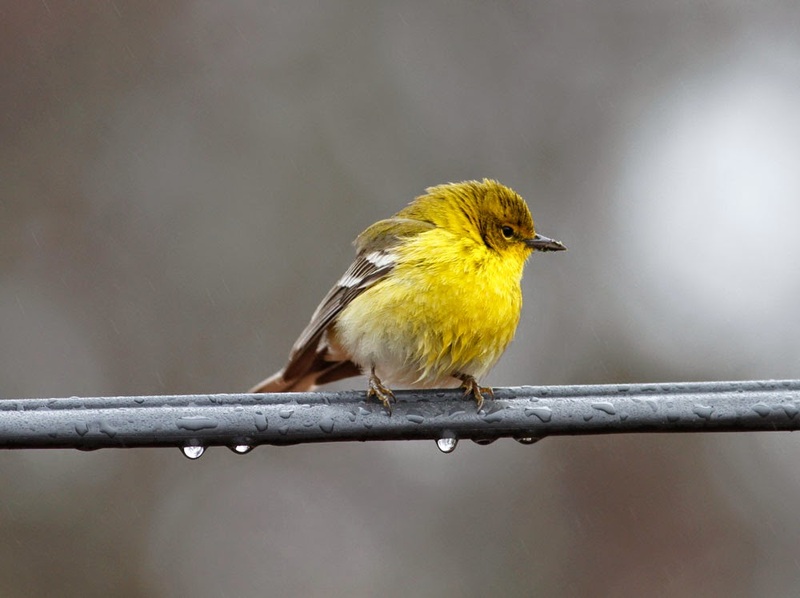 Another dull, damp drizzly day so this Pine Warbler at Turner's Falls was especially welcome and enough to bring a splash of color to an otherwise pretty dull day. Again, Eastern Phoebes were a big feature along the Turner's Falls power canal and bike path, and I tallied about 30 on my ride today including two concentrations of four birds each. Golden-crowned Kinglets also featured with about five along the power canal and bike path. 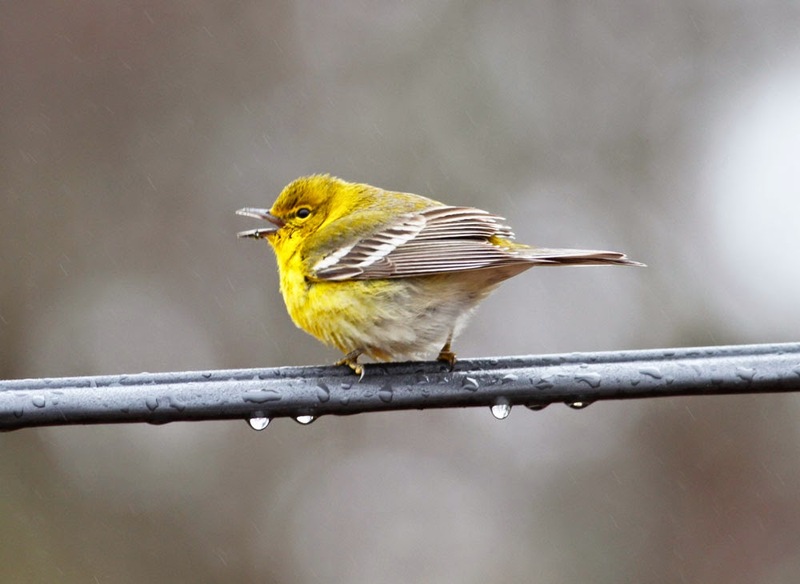 Pine Warbler - Turner's Falls power canal, Franklin Co., MA. April 10th, 2015. An unusually bold bird and my first local one of the year. 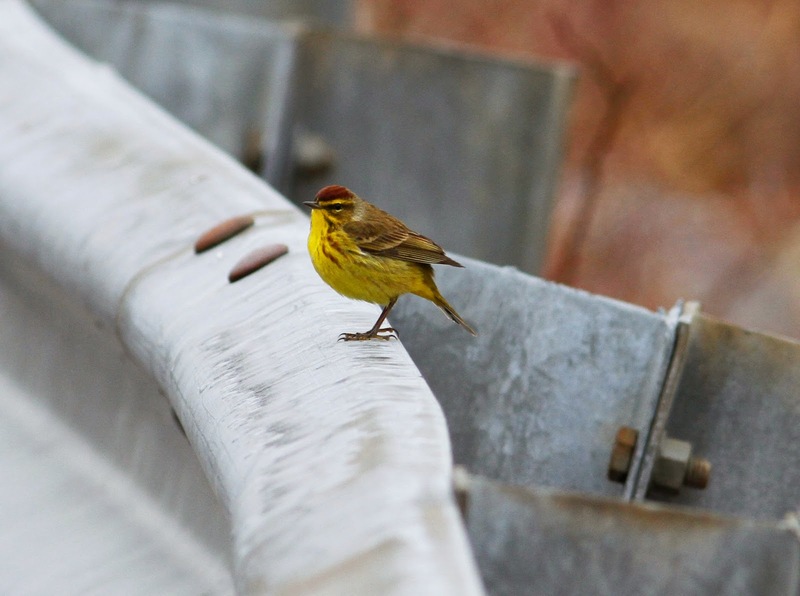 (Eastern) Palm Warbler - Riverview Drive, Gill, Franklin Co., MA. April 9th, 2015. Lovely bright male and my first local warbler of the year. It wasn't much fun to wake up and find a 1/2 inch of fresh snow accumulation this morning. 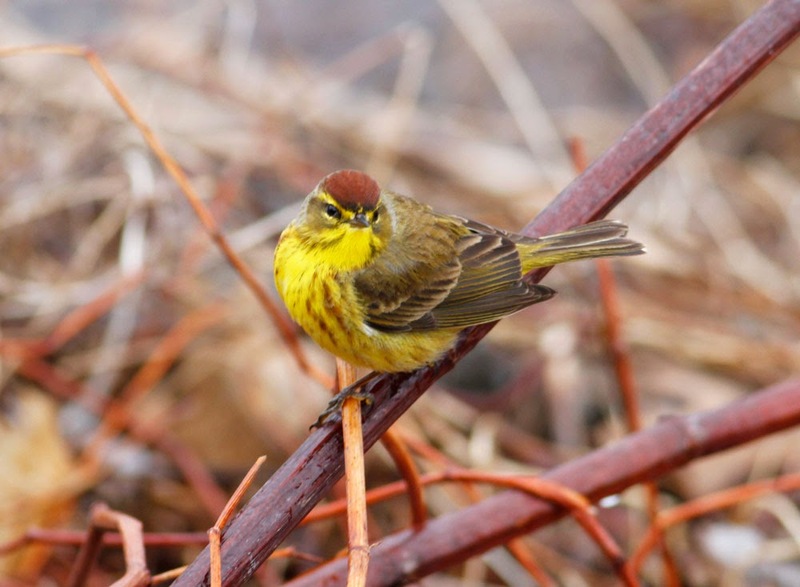 Early migrants much have shivered (or worse) but by the end of the day I'd noted some good diversity in our area with a nice bright eastern Palm Warbler leading the way. 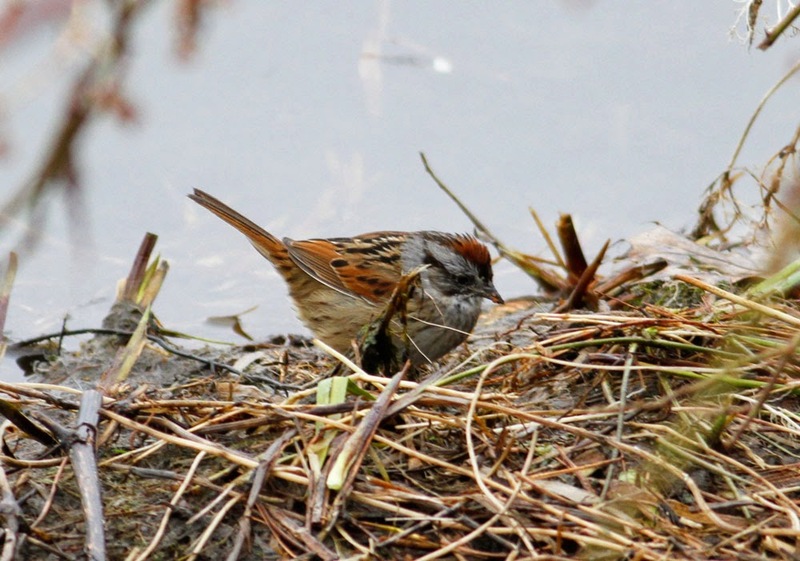 It was also a great day for sparrows with singing Fox Sparrows at Barton Cove and Pine Meadow Road (2), and the first Swamp and Savannah Sparrows of the spring. Indeed, Pine Meadow Road in Northfield proved to be today's sweet spot with Snow Goose, Northern Harrier (male) and Rusty Blackbird in addition to the sparrows mentioned above. By late afternoon, with temperatures rising to a balmy 35 deg F, some 20 Tree Swallows and 2 Northern Rough-winged Swallows were hawking above Barton Cove with an additional 10 Tree Swallows above the Turner's Falls power canal. Swamp Sparrow - Riverview Drive, Gill, Franklin Co., MA. April 9th, 2015. Savannah Sparrow - Pine Meadow Road, Northfield, Franklin Co., MA. April 9th, 2015. At least 6 feeding close to each other in this muddy, snow covered pasture. 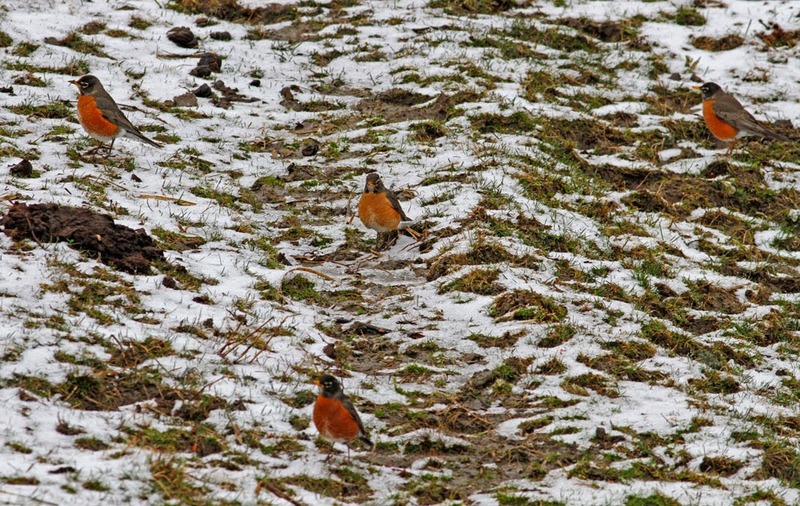 American Robins - Pine Meadow Road, Northfield, Franklin Co., MA. April 9th, 2015. Still huge numbers of robins in the Gill/Northfield area. 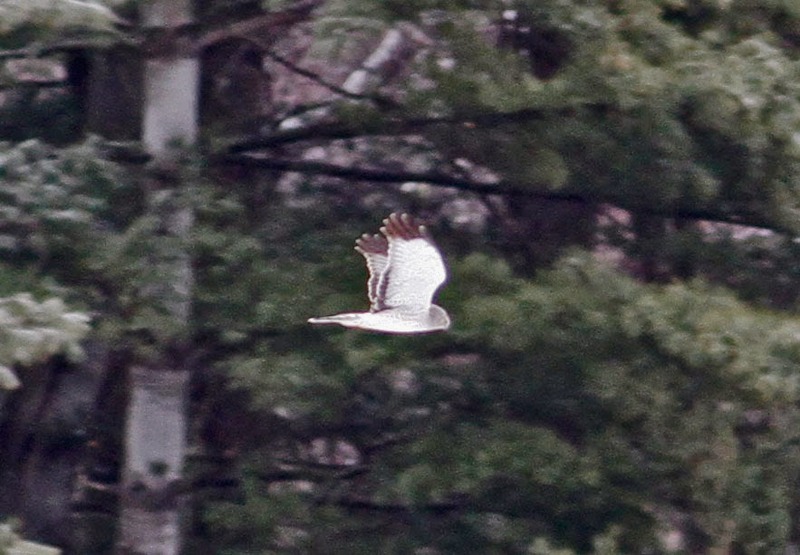 Northern Harrier (male) - Pine Meadow Road, Northfield, Franklin Co., MA. April 9th, 2015. Killdeer - Barton Cove, Gill, Franklin Co., MA. April 9th, 2015. 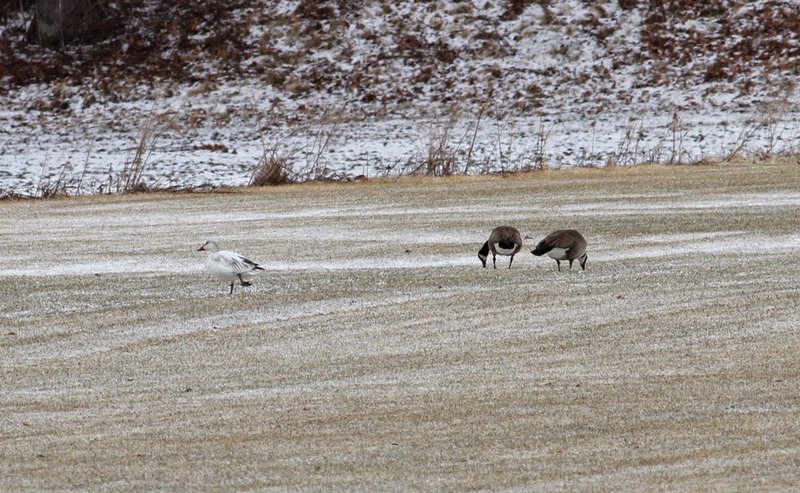 Snow Goose (imm) - Pine Meadow Road, Northfield, Franklin Co., MA. April 9th, 2015. The open water at Barton Cove, Gill remains full of diving ducks though a drake Northern Pintail was the only obvious new bird there today.